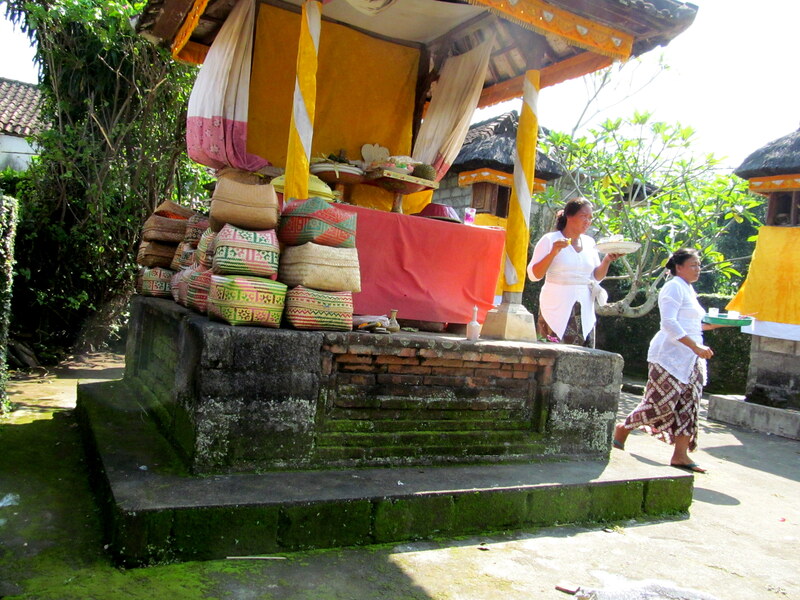 A day without ceremony is, in Bali at least, like a day without sunshine. 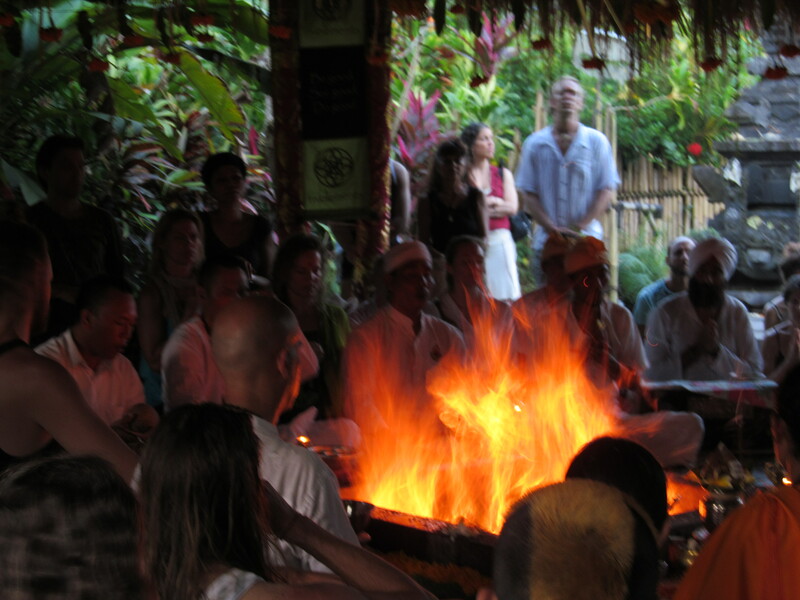 And since the possibility of a sun-less day on this tropical island is close to nil, you can get a pretty good idea of how often ceremonies take place. I’ve attended 3 or 4 wedding ceremonies (or parts thereof), so I’m getting somewhat accustomed to the rhythm and ritual: I was invited last week. Tentatively, because this was the message from Kadek: Rumor has it that my friend is getting married next week, but I’m not yet sure. Inv itations and offerings were delivered a few days ago (sometimes they are delivered the same morning), so it was a go. The women – relatives, neighbors and friends – began the long process of cooking and creating offerings for the day. The men, in the wee hours of yesterday morning, slaughtered pig, whipped up delicacies consisting of sate and lawar (from which I always abstain). By the time Kadek picked me up and we arrived at his friend’s family compound (just before 9 a.m.), the ceremony was already underway; the pemangku (village priest), seated on the terrace floor outside one of the rooms, surrounded by petals of many colors, was reciting mantras and ringing his brass bell. The couple knelt nearby, joining in his prayers as instructed. Invited guests were sitting in the shade, chatting quietly, drinking tea or Sprite, nibbling on fruit and kue (cakes), looking up wit h a smile when I approached – dressed appropriately, in kebaya, sarong and sash. The next part of the ceremony was my favorite, involving rituals that – with humor and much instruction along the way – symbolize the couple’s union, each of their roles and responsibilities towards each other, and a nod to the fertility deities. Under the guidance of family members, the couple walks circles around a mat piled high with offerings, coconut husks, incense – and dead chickens. The bride carries on her head a basket of household goods (cooked rice, sate, herbs and more; but all I saw were towels) while the groom hoists onto his shoulder a branch from the sacred dadap tree with a young coconut strapped to it. An elder (perhaps one of the fathers) follows in their footsteps, carrying a straw broom, tapping the bride and groom from behind, attempting to cleanse them of any evil spirits that may be lingering. Afterwards, the bride and groom fed each other rice and placed a few grains on the forehead, the heart and the feet. They passed through a string tied to two branches of the dadap tree planted into the ground. Then they took turns sitting briefly on a coconut, later to be placed under the bridal bed; a symbolic enactment to ensure the wife’s fertility. After the groom uses a kris (ceremonial dagger) to pierce a square piece of palm matting held by the bride – to symboliz e losing her virginity – the ceremony ends. At least the morning portion, with priest and pomp. By the evening, the couple would have bathed in the river (with more rituals and prayers), visited the bride’s family compound with offerings to her ancestors – and to let them know that she has officially joined her husband’s family – and then returned to the groom’s home for yet more prayers at the family temple, music and entertainment. But my evening included a ceremony of a different sort; a fire puja bringing an end to the five-day yoga, dance and music extravaganza known as BaliSpirit Festival. Festival volunteers and presenters were invited to a luxurious resort – Five Elements – outside of Ubud to partake in a gratitude dinner and slideshow. 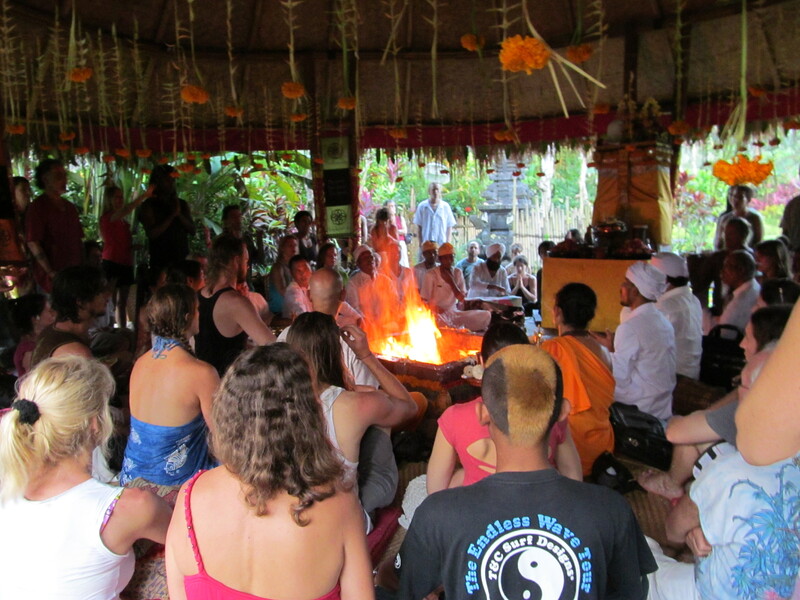 First order of busin ess, under the yoga shala, was a puja; with 6 or 8 priests attending, and participants seated all around a large sunken pit, prayers, mantras and fire lit up the already-electric atmosphere, bringing some to tears, others to smiles and joy. Many sat in silence, eyes closed, as if in worlds far away. Seeds were sprinkled into the pit, bindis were applied to foreheads (not mine) and chants were sung and hummed. Coconuts were broken, the juice left to flow on the grass outside; the shell s thrown into the pit emitting a smoky aroma that wafted well beyond the shala perimeter. I left the puja site to wander off, my path lit by tea candles ensconced in palm leaves on the ground. I just had to maximize this experience amidst these exquisite surroundings, so I found a spot tucked away on the terrace outside a massage studio, overlooking an infinity pool, the streaming river below and lush hillside acr oss. I nestled onto a thickly padded lounge chair, tuned into the sounds of nature, and watched in awe as luminescent birds, graceful vultures and egrets soared in the sky above. To be surrounded by so much natural beauty. And to witness the spirituality which is so tightly intertwined into daily life (and death) on this island. 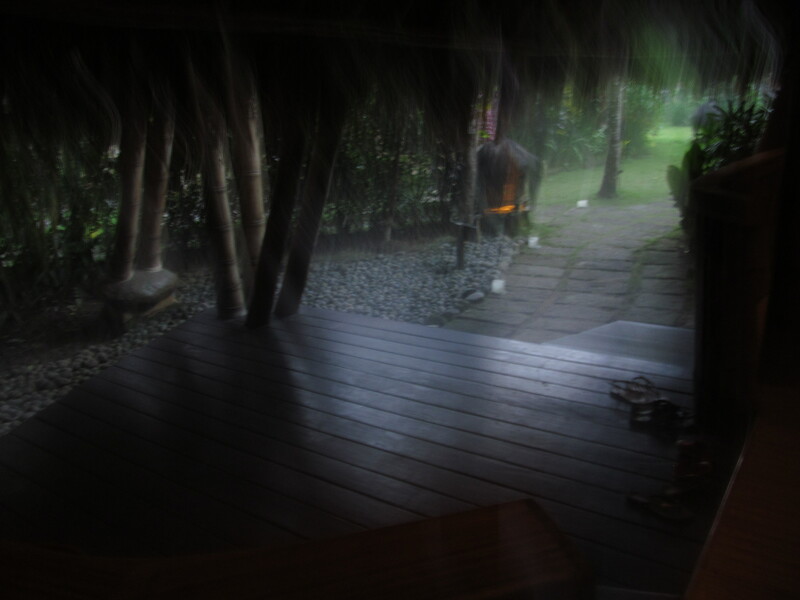 I like and agree with your words “A day without ceremony is, in Bali at least, like a day without sunshine”. Yes, I always see flowers as offering anytime, anywhere. That makes Bali more colorful and unique. Terima kasih for your share, it is entertaining and inspiring! Sama sama and thanks for dropping by my blog Sonny. And then, sometimes, the rain falls too..